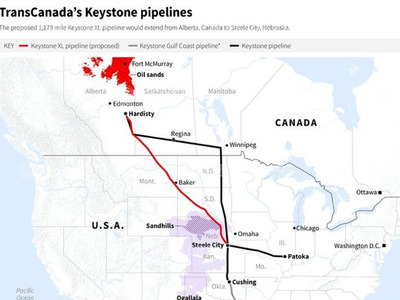 ReutersMap showing the proposed route of TransCanada’s Keystone pipelines. The Republican-led US House of Representatives approved the Keystone XL pipeline on Friday, but a similar measure struggled to get enough support in the Senate and President Barack Obama indicated he might use his veto if the bill does get through Congress. The legislation, approved by 252 votes to 161, circumvents the need for approval of TransCanada Corp’s $US8 billion project by the Obama administration, which has been considering it for more than six years. 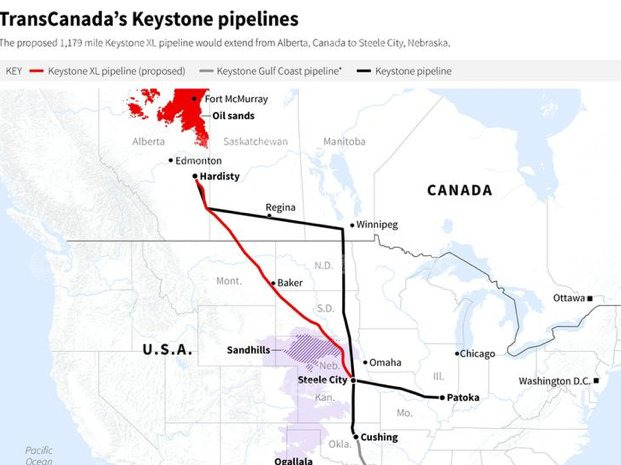 Approval for the pipeline, which would help transport oil from Canada’s oil sands to the US Gulf coast energy hub, has rested with the administration as it crosses an international border. Passage of the companion bill was not assured in the Senate, which is expected to take up the measure next Tuesday. Supporters were still one vote shy of the 60 needed to overcome a filibuster, a blocking procedure, an aide to a Keystone supporter said on Friday. The aide spoke on condition of anonymity. Speaking at a news conference in Myanmar on Friday, Obama said his position on the 800,000 barrels per day pipeline had not changed. Democratic Senator Mary Landrieu, the head of her chamber’s energy committee, is co-sponsoring the Keystone bill in the Senate with Republican John Hoeven of North Dakota. She is battling to retain her Senate seat in a runoff election against Cassidy on Dec. 6, after last week’s midterm elections.